This tall building in the center of Belgrade has a very interesting story related to its predecessor. City of Belgrade itself holds a record number of times it was destroyed to the ground, and hides some very good stories in the layers of its history. On your Belgrade tour, you can simply not miss Albania Palace because it is located in the center of the city in the vicinity of Republic Square. 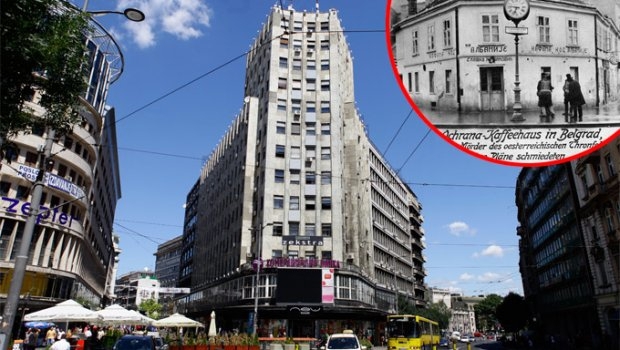 It was unique building in the time it was built because of its height and citizens of Belgrade admired this feature but at the same time greatly missed the “Albania” tavern that stood at the same place and had to be torn down. Controversies about this once tallest building in the Balkans, built on-site of unattractive but very busy tavern are not solved to this day. Construction of Albania palace caused much attention among citizens of Belgrade of that time, more than new generations in Belgrade can even assume. No one knew the exact date the tavern “Albania " was built. Everyone agrees that it originates from the 19th century. While some have speculated that it was made at the beginning of the century, others believe that it was built in the middle of the century. House was built in the Turkish style, and it hosted the officers and soldiers of both Serbian dynasties, and the Turks before they finally left town. Tallest buildings in Belgrade in the 19th were up to two floors (which is a Turkish regulation from the time they were ruling Belgrade) while western influences were just starting to feel, as well as awareness about the creation of a national style in architecture. Tavern “Albania” consisted of the basement, ground and first floor. In the mid-thirties of the 20th century, after the sanitary inspection of the tavern, the written report remained that is showing a general impression of its state of neglect. It had a floor made out of mud, covered in all kinds of liquids and dirt, the kitchen was cramped, with low ceiling, dark and not at all protected against fire, while in one of the windows there was a barbecue, and in the basement retaining walls were made out of stone and mud. Despite the poor state of the tavern, it was the favorite gathering place of Belgrade residents, who went there to socialize and they didn’t mind its bad appearance on the outside or the bad conditions inside. Belgrade residents were reluctant to abandon their favorite gathering place , and tavern "Albania " was full of guests on the day it was to be demolished , they were all there to enjoy the last drink at this place even after the water and electricity were cut. The guests were served until the firemen started to take the tiles off the roof. The whole event was accompanied by a large number of spectators who were returning from evening cinema performances. Try-out for preliminary sketches was announced by the Commercial Bank Mortgage Fund in Belgrade on 14 January 1938. In the try-out, 84 architects applied, but nobody won the first prize. This was explained with their decision to give up the construction due to the bad situation in Europe. That did not stop them to build a high rise building in just one year on the grounds of demolished tavern “Albania”. This construction was followed by critical comments, fears and doubts of Belgrade residents who missed their favorite gathering place. When Palace Albania was built in 1939, it was the tallest building in the Balkans. Due to its dimensions - a height of 45 meters and 12 floors, and two floors below ground and an area of ​​7,000 square meters, it is quite logical that the construction of this building was followed with disbelief and doubt since it was a building unseen in Belgrade until then. Many records show that construction workers found bones of the mammoth while digging the foundation which has only confirmed that these prehistoric animals inhabited the area of today's city. There were fears that the underground water will affect the settlement of the foundation and that building will collapse, but none of that happened. Palace was hit by a half-tone bomb in 1944 was during an Allied bombing in World War II because it was at that time the main headquarters of the Nazi work organization " TOT " - which turned into underground shelter for high German officials . On that occasion, all of the Germans in the shelter were killed, but the building itself did not suffer major damage. The reinforced concrete structure then underwent a real test, more than successful. In 1983, it was proclaimed a cultural monument of great significance.